This press release originally was posted on GIS Cafe. 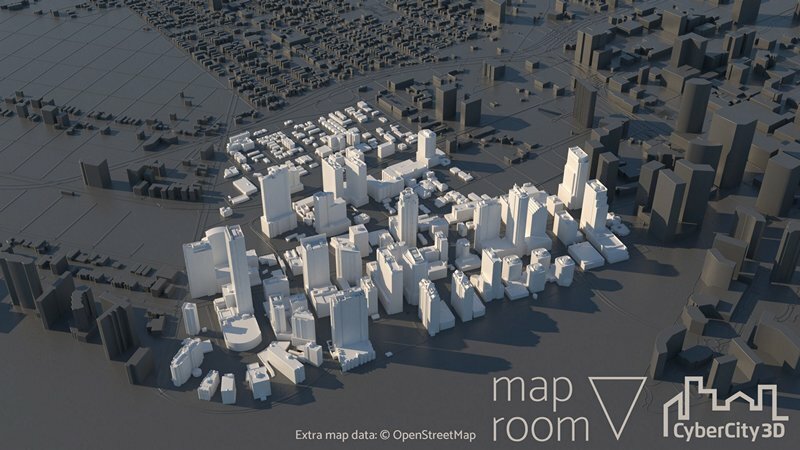 Maproom, a powerful plug-in invented by Netherlands-based software developer Klaas Nienhuis, now enables users to create streamlined 3D city models quickly and easily in Autodesk’s 3ds Max®. Nienhuis developed Maproom to make it fast, easy, and straightforward to build a real city in just minutes. Maproom teamed with Southern California-based CyberCity 3D, Inc. (CC3D) to create a new CC3D layer which offers highly accurate 3D city models to 3ds Max users. This is a boon to those needing to build a city map fast for site simulations, animation, virtual reality, movies, games, architectural visualization, etc. With the availability of CC3D buildings boasting up to four-inch accuracy, users get more precise, visually stimulating creations. The CC3D layer in Maproom adds these light, yet highly accurate, 3D buildings to your map. CC3D creates them with its patented modeling technology utilizing photogrammetry of stereo imagery. This makes the buildings perfect for city-wide visualizations. City model of Miami built with Maproom and CC3D buildings. This sample area ships with Maproom for free. 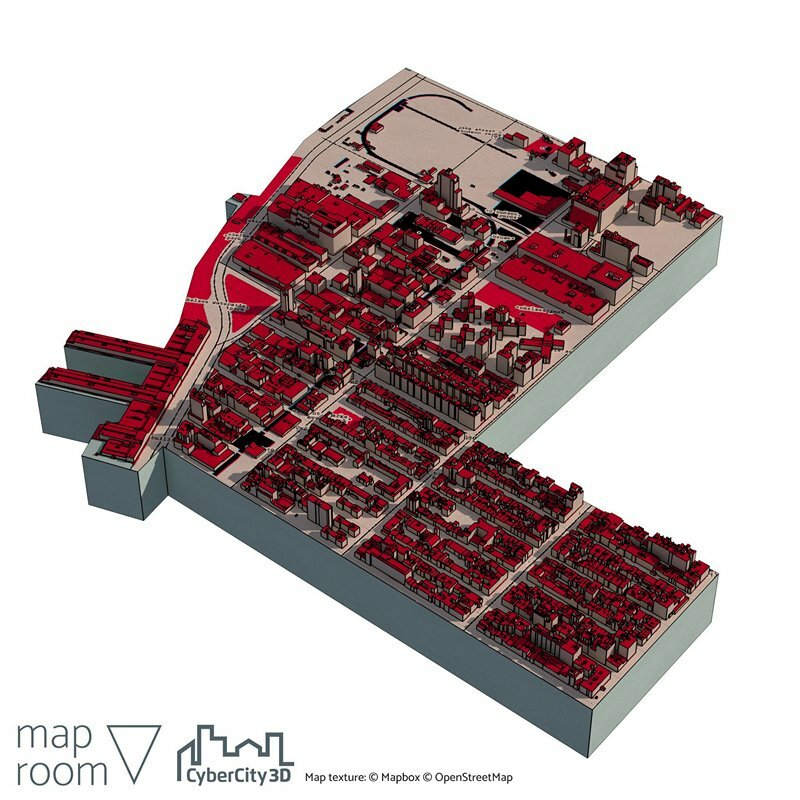 Maproom users can purchase immediately available “off the shelf” city models from CyberCity 3D directly through the Maproom plug-in. Don’t see what you need? No problem. 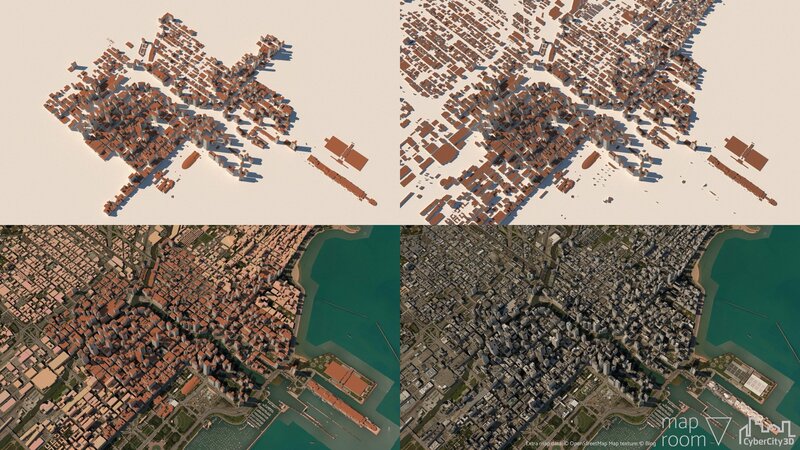 CC3D also creates “new build” city models around the globe on demand. Maproom enables you to easily define the area you need and communicate that information with CC3D. Please note that you must purchase Maproom Pro to use CyberCity 3D data in Maproom. Want to see how Maproom expands your 3ds Max world? The free version of Maproom ships with sample CC3D data or parts of London, Miami, and New York, so give it a spin! Map with CyberCity 3D buildings in New York. This sample area ships with Maproom for free. Map with CyberCity 3D buildings in London. This sample area ships with Maproom for free. great program, used your free version and I really like it. Is there a list of services the program works with. In addition to bing maps and Openstreet and Mapbox. We use nearmap since it gives us 3 inch resolution. here’s a list of connected image sources: https://klaasnienhuis.github.io/MaproomDocumentation/layers/Satellite.html#image-source. In addition to this there’s also DigitalGlobe in various flavors. 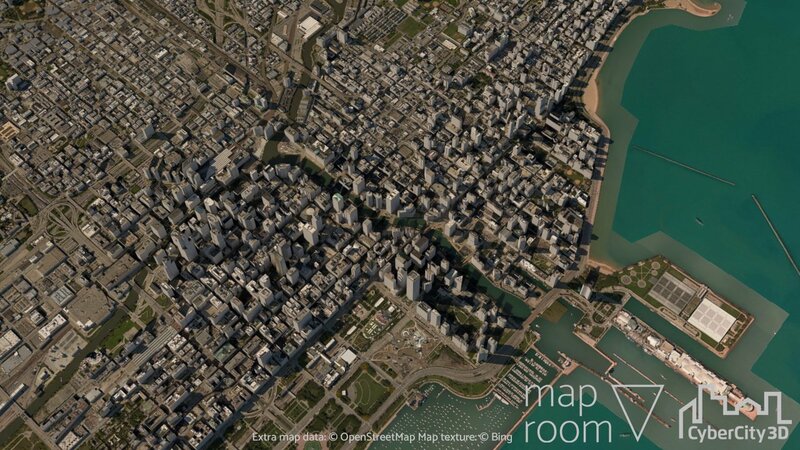 I’ve read a bit about nearmap and their API seems to be a bit different than regular mapping API’s. But it might be possible to connect Maproom to Nearmap if their terms allows it. what restrictions are put on demo version ? Hi sietycki, the demo version has less map layers available. Also, maps based on satellite images are restricted in size. Does it work with 2019? I downloaded the free version but it gets to the initial load screen to agree to the terms, and I can’t get any farther. Hi Doug, yes maproom works in max 2019. But max 2019 has an unfortunate bug which disables all .net scripted interfaces. When you update max 2019 with one of the available updates, such as 2019.3, maproom (and all other scripts with a pure .net interface) will work again. Is it possible for me to create 3D model of a city for a driving game? I tried your demo version but I couldn’t load the 3D model of New York, NY after downloading 3D models of three sample cities. How can I load the sample cities into 3DS MAX 2019? Is it possible for me to create 3D model of Staten Island, NY for a driving game? I tried your demo version but I couldn’t load sample cities into 3DS MAX. How can I load sample cities into 3DS MAX? 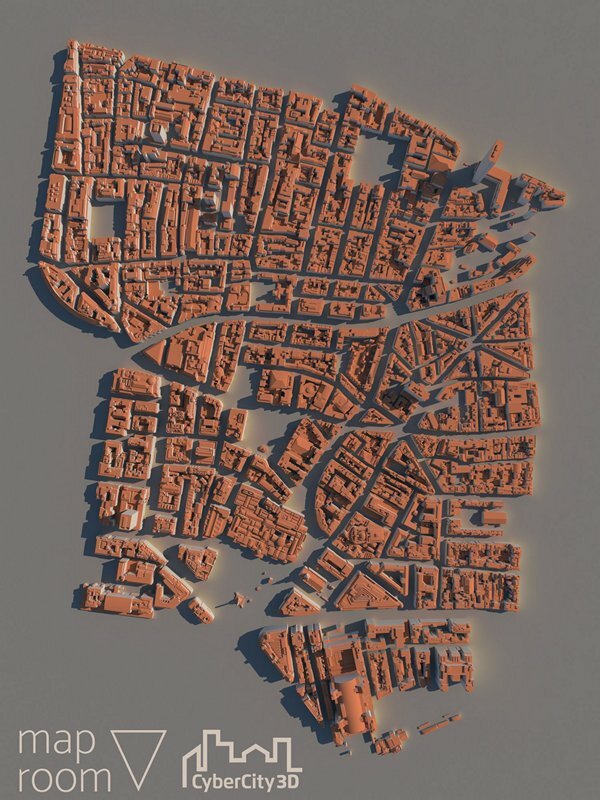 It’s definitely possible to create a 3D city map for a driving game.